Everyone has their own little piece of paradise on earth. Mine is definitely located somewhere on Omis Riviera of Adriatic coast in Croatia. June 2014, panorama from 2 horizontal images, additional exposures for highlights, focal length 16mm, aperture f/11, shutter speed 15 seconds, ISO 100, 5-stop ND filter, tripod. How it is happen, that Croatia got such a wonderful land? An old legend says: “Once upon a time, God decided to give away lands to the different countries. The best lands went to the countries which had arrived first for the draw. Other lands went to the countries which had arrived later and the worst ones to the countries which had arrived at the very end. When the Croatians finally arrived (even later than the others) there was not even one land left for them. This way, the Croatian people, while arriving the last of all, still got the best land ever created on earth! My early morning photo shoot started with an enjoyable walk from the house high up in the mountains to the rocky beach. Not a noise, not a person in sight, I enjoyed a blissful feeling on this quiet track through the pine trees. The clean atmosphere of a summer morning, with its rich and fantastic smell of pine, flowers and sea salt, was surrounding me with an exhilarating mood. Biokovo Mountains ridge in sight, I deepened myself in the clear seawaters, and adjusted my composition to capture the magical light of sunrise, illuminating the white stone boat sculpture in the background. I felt like it was the day God created this small paradise. 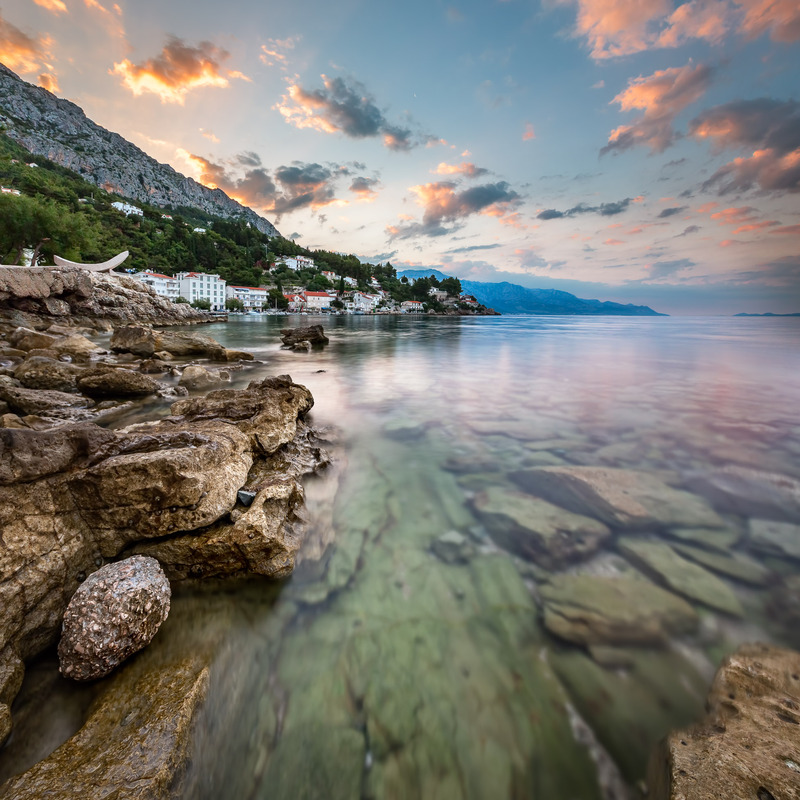 This entry was posted in Landscape and tagged Croatia, Omis Riviera.